Looking for the best places to celebrate the arrival of the New Year in Europe? Here are 5 of the best. New Year’s Eve is a special night for many, holding an almost magical, certainly optimistic place in our hearts. It’s all about friends and family, having fun, and welcoming in the new year with gladness and exciting future plans. So why not join in the celebrations somewhere a little different this time? Why not start as you mean to go on by exploring new places and discovering new people and adventures? Parties are the thing in Amsterdam. No matter where you go, you will find a group of people (sometimes a huge group of people!) having a fantastic time. 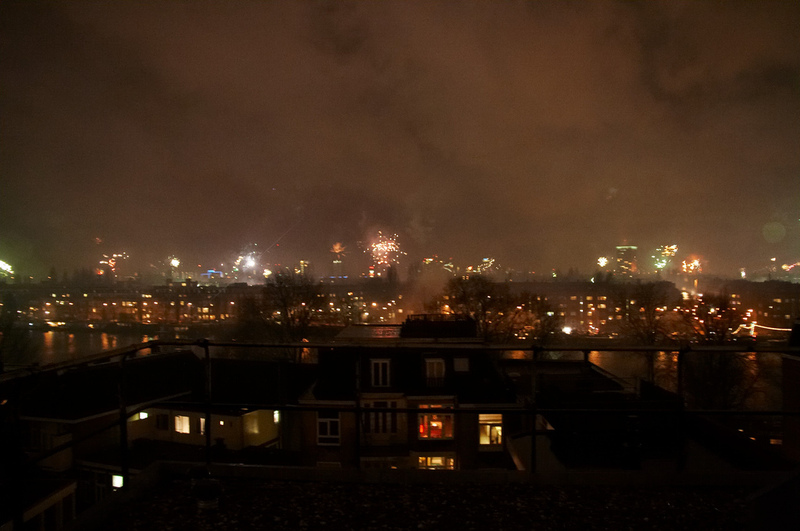 In the main squares of the city (Nieuwmarkt, Dam, Rembrandtplein, and Leidsplein) there are pop up parties that appear on New Year’s Eve and are usually free – all that is needed is yourself and a sense of fun. With beer tents, live performances of dance, acrobatics, and stand up comedy, and fireworks these are great for getting into the party spirit. If you prefer something a little more organised, however, just head over to The Amsterdam in Oosterdok. This is an 18th century ship where the Scheepvaartmuseum is based, and this is where the official city celebrations take place. With a huge fireworks display and food vendors galore, there really is no other place to be. Prague is a stunning place to visit at new year. It looks like something out of a fairy tale, and if you are searching for somewhere romantic to see in the next year then Prague could well be the perfect spot. Not only is it beautiful, but the fireworks here are amongst the biggest and brightest in Europe, and standing in Wenceslas Square, or on the Charles Bridge will give you the best view of all. If you want to take the children, then they are also catered for. Although the main events all happen at midnight (naturally), if your little ones can’t stay up that long then there are also fireworks at Prague City Hall at 6pm. Now no one needs to be left out. On a list of iconic places from which to watch the New Year fireworks, a boat on the river Danube has to be up there with the best. And that’s exactly what you can do in Budapest. If you prefer to keep your feet on dry land that’s not a problem; there are plenty of fantastic places to enjoy the fireworks from in the city itself. The great thing about Budapest’s new year’s celebrations is that they start before anyone else’s, on 30th December, and go on well into 1st January. The main action is centred on Vorosmarty Square where there are food stalls and street performers galore. Or if you like the idea of staying inside, make your way to Liszt Ferenc Square which is renowned for its bars and restaurants, many of which stay open for 24 hours during the three day party period. Fancy a sit down? The Budapest Opera House offers New Year’s Eve concerts which range from classical to pop and rock! There are so many Spanish traditions centred around New Year’s Eve that you’ll probably find yourself joining in with some whether you intended to or not! In Madrid, as the chimes start counting down to midnight, it is expected that everyone eats 12 grapes – one for every chime of the clock! That’s some fast eating, but if you manage it you will have good luck for the next 365 days… It has become something of a competition in Madrid, and is certainly something to look out for. Once the grapes have been consumed and the midnight hour has come, the party begins and will go on until 6am or so the next day. This is the place to come if you enjoy good food and sparkling wine, as most of the restaurants offer a set New Year’s Eve menu which includes Champagne or Cava! The Parisians throw a sophisticated party when it comes to New Year’s Eve, and you’ll find that the Champs Elysees is packed full of revellers clutching picnic baskets full of cheese and bread (with lashings of champagne) ready for the night ahead. Come midnight, there is a stunning light show at the Eiffel Tower, and if you want the best view of all then you might want to consider taking part in a cruise along the Seine. These cruises include dinner and drinks and, although expensive, will be something you’ll never forget. Travel on a mini cruise to Europe.